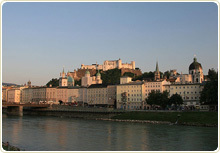 Festung Hohensalzburg or the Upper Salzburg Fortress is maybe the most famous and impressive sight in the city. This majestic castle occupies a prominent position, perched on the top of the Mönchsberg Mountain, dominating the Salzburg's landscape and offering breathtaking views over the city and the valley of the Salzach River. The first fortress on the site was probably built by the Romans who appreciated the strategic position of the place. However the Roman presence here has not been firmly proven by the scientists. According to the written historic sources the first castle was completed in 1077 by the Prince Archbishop Eberhard. These first fortifications were made of wood and served for protection against the Imperial military forces during the period of the so called Investiturstreit or the struggle for more power between the Emperor of the Holy Roman Empire and the Pope. The Archbishop of Salburg took the side of the Pope and fortified his city against the Emperor. During the first half of the next 12th century the wooden walls were replaced by new ones made of stone and a mighty stone tower was added to the castle by the Prince Archbishop Konrad I. In the second half of the century and the next 13th century the castle continued to expand occupying most of the top area (Bering) of the Mönchsberg Mountain. The rivalry between the Holy Roman Emperor and the Pope had been long finished by that time but there was a new danger for the city coming from the conflict between Austria and Bavaria, demanding Festung Hohensalzburg to be continuously improved and strengthened. Another powerful prince archbishop of Salzburg - Burkhard III von Weißpriach strengthened the medieval ramparts with four strong towers in the period between 1461 and 1466. These towers are preserved until present day in their entirely authentic appearance: Glockenturm (the Bell Tower), Trompeterturm (the Trumpeter's Tower), Krautturm (the Herbs Tower) and Schmiedturm (the Blacksmith's Tower). The successor of Archbishop Burkhard III - Bernhard von Rohr ordered the Rohr bastion to be constructed as he needed stronger protection in the turbulent time of his reign when the miners in the area south of Salzburg rebelled, the city's aristocracy wanted to play a more important role in the local government and the invasion of the Ottoman Empire was coming closer and closer. In the end of the 15th and the beginning of the 16th century came the time when the Hohensalzburg Castle almost entirely lost its military and defending functions and turned into a representative palace of the local archbishops. 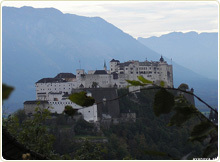 The Archbishop Leonhard von Keutschach spent a considerable amount of the large revenues coming from his gold mines and from the so called "white gold" obtained at the salt mines of Hallein to reconstruct the gloomy medieval fortress into a splendid palace corresponding to his wealth and political power. The castle was extended and underwent full renovation and reconstruction works. During that time were built the magnificent Hall of the Prince (Fürstenzimmer), the Church of St Georg, several exquisite representative halls and the famous Salzburger Stier or Salzburg's Organ. The Leonhard von Keutschach's characteristic coat of arms representing a turnip can be seen on 58 marble plates decorating different areas of the castle.